Vanessa's Card Studio: Thoughtful Branches! New & Limited Edition! 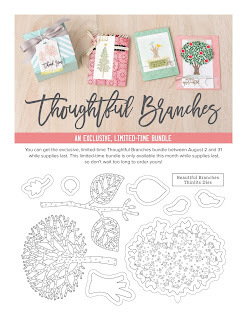 Thoughtful Branches! New & Limited Edition! 1. If you earned bonus bucks last month, you get to spend those this month! WooHoo! 2. 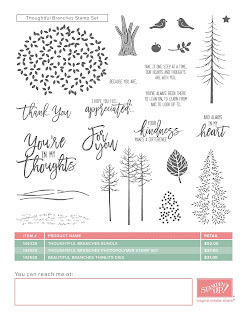 A new stamp and die set is available for purchase, but only while supplies last. It's awesome and you will want it, so don't wait too long to get it! 3. My local Cards & Coffee event is ready to go and will be held on Sunday, August 21st. 4. This month demonstrators get to order things from the holiday catalog. If you're in my downline, today is the day! If you're not a demonstrator yet, maybe today is the day you sign up! Last chance for Thoughtful Branches! Who's ready for the Holiday Catalog? Thoughtful Branches & Cherry Blossoms!